A major cyclone recently passed by Samoa . The Category-5 Cyclone Winston recently devastated Fiji , resulting in more than 44 fatalities and dislocating 350,000 people . Natural disasters will continue to ravage our Pacific neighbours. Nearly 10,000 people have been killed, and as many as 9.2 million people have been affected by natural disasters  in the region since 1950. Australia should be supporting the islands recover from such disasters through catastrophe risk insurance. Given their size, borrowing capacity and restricted access to insurance markets, Pacific island states have real problems in raising post-disaster finance. Advancing the islands capacity to meet post-disaster funding requirements by using insurance to immediately access cash should be a top regional priority. Some years ago, the Caribbean established a catastrophic risk insurance facility  with the assistance of the World Bank. The insurance facility is a parametric insurance scheme: payments of claims aren’t based on actual losses or damage following natural disasters but are instead calculated according to predefined indexes based on the intensity, period and location of a disaster. Countries can buy coverage limited to specific events and specific areas, and for a specified amount of time. States can alter the amount they allocate for each disaster. In the Pacific, there’s been a similar pilot project led by the World Bank  operating for the last three years. The pilot’s made two payouts in the last couple of years, to Tonga  and Vanuatu , totalling US$3.2 million. Both payments were made within 10 days of the disasters. The scheme provides rapid cash injection to bankroll urgent recovery costs. But it doesn’t cover all losses, including more frequent—but less severe—events. The Pacific pilot has been unable to provide the range of insurance products that the Caribbean scheme’s been able to provide to its member countries. The Caribbean scheme pays out on the intensity of the event, rather than an evaluation of specific damages. The Pacific disaster insurance pilot  concludes this October. But there are regional plans to establish a Pacific entity, connected to the Pacific Catastrophe Risk Assessment and Financing Initiative , to advance a regional disaster insurance arrangement. Countries such as Vanuatu, Samoa, Tonga, the Cook Islands and the Republic of the Marshal Islands have expressed willingness to be part of such a scheme. The initiative requires a pool of funding. Germany is already on board . Australia should also make a respectable contribution to funding in order to assist the disaster resilience of regional countries. Humanitarian relief efforts, like the $15 million we recently gave Fiji after Cyclone Winston , are certainly appreciated by island governments and the affected communities. But we could assist in sponsoring regional catastrophe risk insurance or support access to immediate funds through guarantees to short-term loans that are necessary for national liquidity. We can work here with Japan under the bilateral strategy for cooperation with the Pacific  that both countries concluded in February. The strategy recognises the need to help the islands better respond to natural disasters. Supporting a regional insurance scheme would also allow us membership of any catastrophe risk insurance board. We’d be able to shape sustainable regional disaster financing. 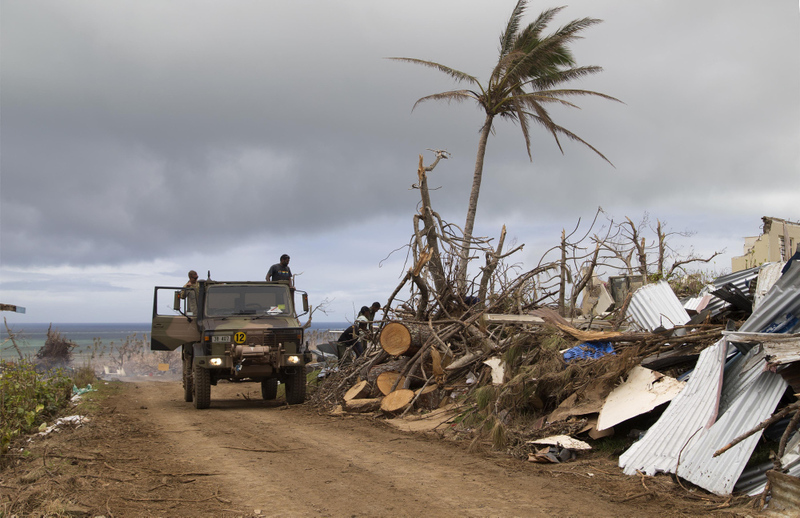 The opportunity to support a regional disaster insurance entity also allows Australia to provide more than just immediate relief efforts—it can help give Pacific island countries ownership of their own financing and sustainability. However, this may require a change in our mindset over how we provide assistance. Humanitarian relief efforts make popular headlines and are relatively easy to sell to the electorate—disaster risk insurance isn’t as marketable. Pacific disasters are occurring with greater frequency  so the costs of Australian relief efforts will grow in the coming years. Given most island communities don’t have adequate private insurance schemes, there’s a need to help our island neighbours rebound after natural disasters by incorporating a financial safety net into their disaster management arrangements. We should also be working to implement the recommendations that came out of the first Pacific Islands Forum Foreign Ministers’ Meeting last July in Sydney. At that meeting, the issue of Disaster Management was discussed by Ministers. The recommendations from the meeting (available here ) should be progressively implemented to support improvements in preparedness, capacity, legal and institutional issues and to respond to calls for flexible and accessible funding. Ultimately, Australia should do more to help Pacific island countries with access to flexible and accessible funding post disasters. This will support long term sustainable ownership to build resilience through preparedness, relief and reconstruction. Australia has an opportunity to show regional leadership on this, at a time when our neighbours are facing the brunt of climate change.